Will Balfour be Rivera’s replacement in the Bronx? 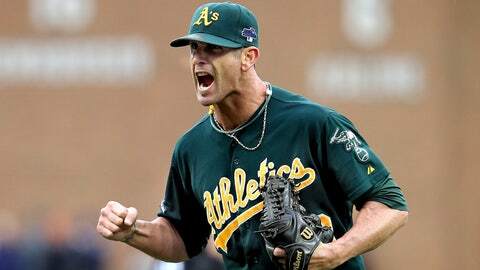 Grant Balfour recorded 38 saves in Oakland last season. The Grant Balfour saga just grew more interesting. Balfour was expected to join the Orioles on a two-year, $15 million contract, but the deal fell through when Baltimore team doctors expressed concern over the right-hander’s shoulder. Balfour insists that other professional physicians have given him a clean bill of health, although it now appears that the Orioles have shifted their attention to other closers, with Fernando Rodney and Francisco Rodriguez among the names being tossed around in conjunction with the O’s. Balfour has served as Oakland’s closer the last two seasons, racking up 66 saves in the process. The Yankees have a closer opening for the first time in a while now that Mariano Rivera has hung up the spikes, so Balfour could fill that role, although David Robertson is expected to be given a shot to earn the job. Balfour, who turns 36 on Dec. 30, posted a 2.59 ERA in 66 2/3 innings over 65 appearances in 2013. The 28-year-old Robertson had a 2.04 ERA in 66 1/3 innings over 70 appearances while pitching in a setup role last season.